Part of the annual World Russia Forum has taken place in Washington, DC, and despite tensions running high between the US and Russia, many speakers were voicing their calls for change. The main message of this year’s event was that the two countries have been at loggerheads for way too long. Despite the US attitude in Congress being unfavorable towards Russia on the whole, some are urging for change. Dana Rohrabacher, a member of US House of Representatives from California, said that the current situation does no good for either Washington or Moscow. “The trend line of our relations is working against the benefit of the US and against the benefit of the people of Russia. And we’ve got to turn this around for both of our countries, and both of our peoples will be so much safer if we were working together rather than looking at ourselves as enemies,” he said. 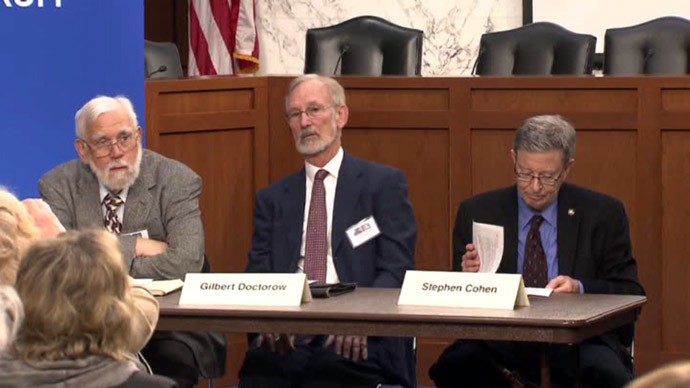 Prominent Russian studies scholar at Princeton and New York Universities, Professor Steven F. Cohen, spoke on the dangers the two countries are facing, should they remain at odds. “Diplomacy between Washington and Moscow has been displaced by another Cold War phenomenon: militarized thinking about politics, [which] leads to the end of politics and the beginning of war. That’s what we’ve witnessing now,” he said. The World Russia Forum has been taking place annually since 2003, and it concentrates on boosting the Russia-US relations. This year’s event is dedicated to the 70th anniversary of the allied victory in World War II and will continue in New York on Friday. The next leg of the forum is set to happen in April in Washington and Moscow.